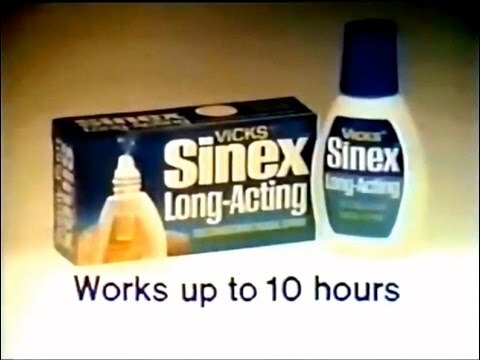 Vicks Sinex is a brand of topical nasal decongestant spray produced by Vicks, a division of Procter & Gamble. The active ingredient contained in the Sinex nasal spray is Oxymetazoline which acts to relieve blocked nasal passages. The recommended dosage is 2–3 sprays in each nostril every 10–12 hours, though users should check the packaging for the specific product purchased. Excessive use of this product could lead to a dependency on it whereby the nasal passages block without use of Oxymetazoline again. Thus it is recommended that Sinex not be used for more than three days. Extra ingredients include camphor, eucalyptol, and menthol, which give Sinex Nasal Spray products the characteristic aroma of Vicks products but could also cause irritation of the mucous membrane.